High Voltage Fun: Sous Vide - Cooking with Sansaire first impressions. 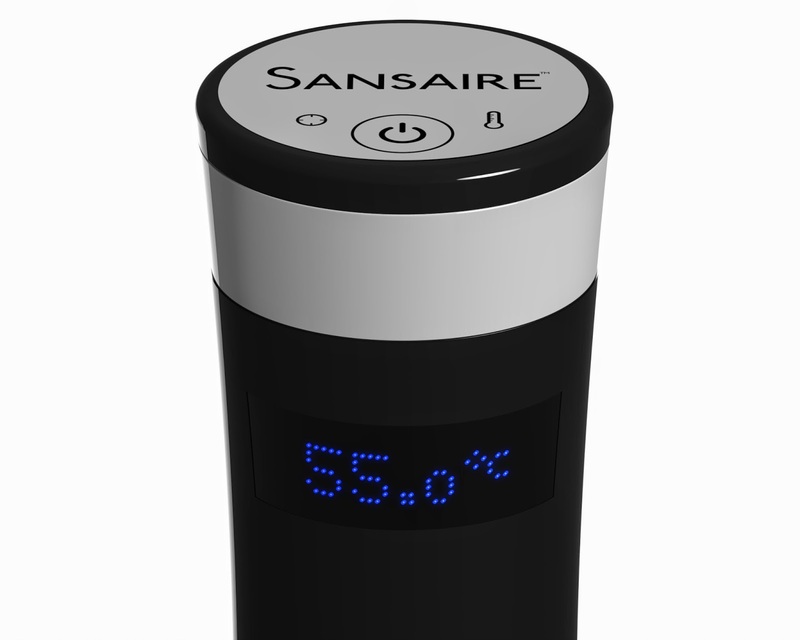 Sous Vide - Cooking with Sansaire first impressions. What is Sous Vide, well it literally means under vacuum, referring to the practice of cooking food sealed in vacuum bags. It has however come to refer to cooking in a water bath a low, precisely controlled temperatures. Why would I want to do this, there are many reason but they nearly always come down to either improving texture or removing timing criticality. Having eaten food cooked using the sous vide method when at restaurants I was keen to find a way of doing it at home without breaking the bank. First I looked at commercial water baths but they were all well outside my price range. Experiments at ghetto sous vide using a cooler and adding hot water to maintain the temp were at best a mixed bag. Providing the cooking time are short (under an hour) and the food you were cooking does not need precise temperature control (so no eggs) you can just about get away with it but all in all it is more hassle than its worth. When I saw the Sansaire on Kickstarter for only $220 including shipping to the UK I decided it had to be worth a try. After a long wait it finally arrived middle of March. As I have only had my Sansaire immersion circulator for just over a month its still early days, here's what I have tried so far. Sorry for the lack of pictures I will add some more soon. Well like most people the first thing I tried was an egg. Having read many article and seen the tables I decided on 63.5c as the cooking temp. This seemed the best way of getting a poached style egg. I was expecting the texture of eggs but was surprised by the flavour, in all the articles I had read nobody seemed to of mentioned that the flavour of the white of the egg improves. For me this was a real revelation, having been used to the white of an egg being pretty tasteless. Next I tried a simple sirloin steak. I first seasoned the steak and then sealed it in a vacuum bag. After cooking at 50c for an hour I finished it off in a searing hot griddle pad for just 30sec on each side. This resulted in a perfect rare steak, although the fat could of done with a little longer on the griddle to give it a bit more colour and crisp it up. Finally I tried a piece of belly pork which skinned and seasoned and them cooked in a vacuum bag at 65c for 14 Hours. Once removed from the bag I dried the meat with kitchen paper and replaced the salted skin and finished in a hot oven for 45min. Once again this turned out well with forkable meat and crisp crunchy crackling. Other than the odd chicken breast this is all I have tried but I will be experimenting more as soon as time allows. First lets get out the way the bad points out the way. Well for me I am yet to find any other than that the back cover is a little difficult to refit. A few others seem to of had issues with the reset button but so far mine is working perfectly. So here are my thoughts in general. 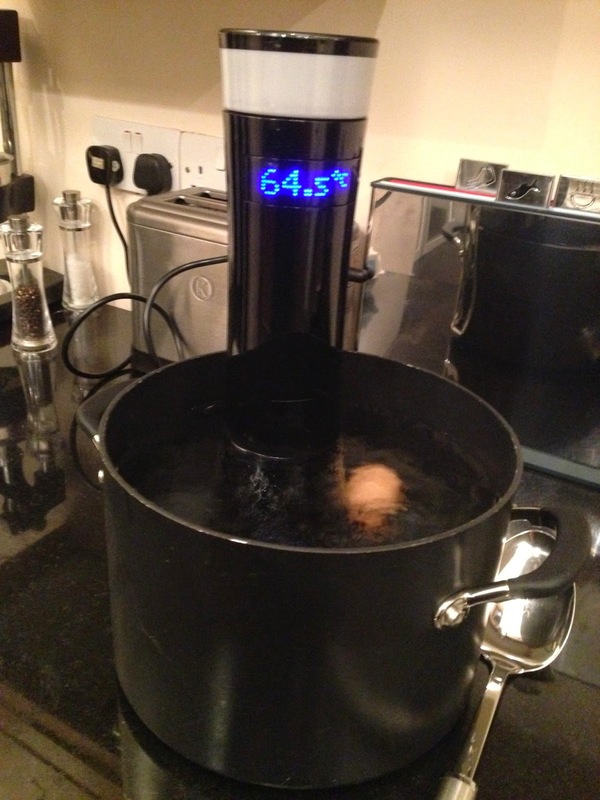 The unit takes a little over 15min to bring a pan of water up to 63.5 to do an egg and once there the temperature holds to within a tenth of a degree. I have check the temp using a calibrated thermo couple and the temp seem to be a tenth of a degree too low which I feel to be acceptable. I like the turning the dial to change the temp but the direction seemed to be counter intuitive. I do however like the clip, the fact that it can be used on a thin walled pan and some thing as thick as a cooler is a real bonus. The clip does struggle with containers with a pronounced lip, including one of the gastronomes I tried it with, but you can't have everything. All in all I am very happy but until I give it a real test I will reserve judgement. Once we get to BBQ season I will have a few more opportunity's to test. As well as trying a few more recipes I am looking forward to trying a blow torch sear meat instead of using a griddle pan. So I think I will try and hunt one out and give it ago at the weekend. Pre empting me liking this I have ordered a Searzall which is an attachment for your torch to help achieve a more even heat and reduce torch taint. Nest Thermostat after 7 days.